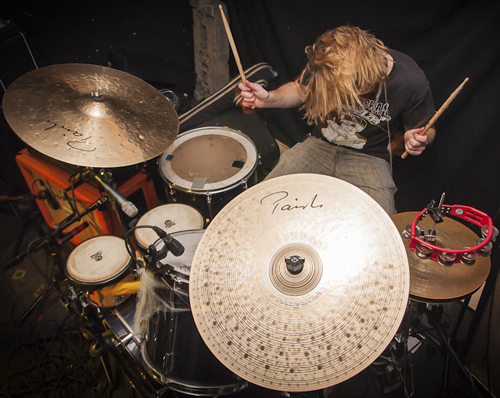 "Makes my drumming sound like an apocalyptic army of zombies with bazookas"
Simon Ridley is the drummer for DZ DEATHRAYS, an indie/thrash/punk 2-piece from Brisbane, who has recently been creating a stir on the international music scene. He and guitarist/vocalist Shane Parsons have toured the US twice for CMJ and SXSW festivals, and recently returned from a tour of the UK that saw them support Cerebral Ballzy and play The Great Escape showcase festival. It’s no surprise that after all that, they’ve garnered a lot of buzz and landed at #8 in NME Magazine’s Best Bands of 2011. They also scored spots in NME’s Top 10 Buzziest Bands from The Great Escape and Q Magazine’s Top 10 Acts from the same festival. They’re gearing up to head back over and release their debut album here in Aus and in UK in early 2012. Simon is killer drummer who has an explosive on-stage presence, much to some punters’ surprise due to his quite unassuming and modest personality. He’s played in various other Brisbane bands including current side-project, Velociraptor.